A Fly on the Wall History: Paul Revere’s Ride | Thomas Kingsley Troupe — Writer. Filmmaker. Action Hero. 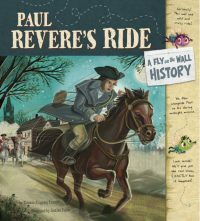 Paul Revere’s Historic midnight ride takes on a new level of excitement when seen first-hand through the eyes of two cartoon flies. Equal parts fact and fun whisk you through one of the key events of the American Revolution. I try to get back to everyone who takes the time to contact me. Visit the contact page for the email form.